Photo © Hotel Grande Bretagne, a Luxury Collection Hotel, Athens. The "routine changes" take place every one hour daily, and involve the two incoming and two outgoing sentries, and a supervising "Corporal of the Change". The Grand Change takes place at 11am on Sunday mornings. If it’s your first time in Athens, then consider your Sunday morning booked. At 11:00 a.m. on the dot, the Evzones give “men in skirts” a whole new meaning with an incredibly disciplined ritual everyone should witness at least once in their lifetime. 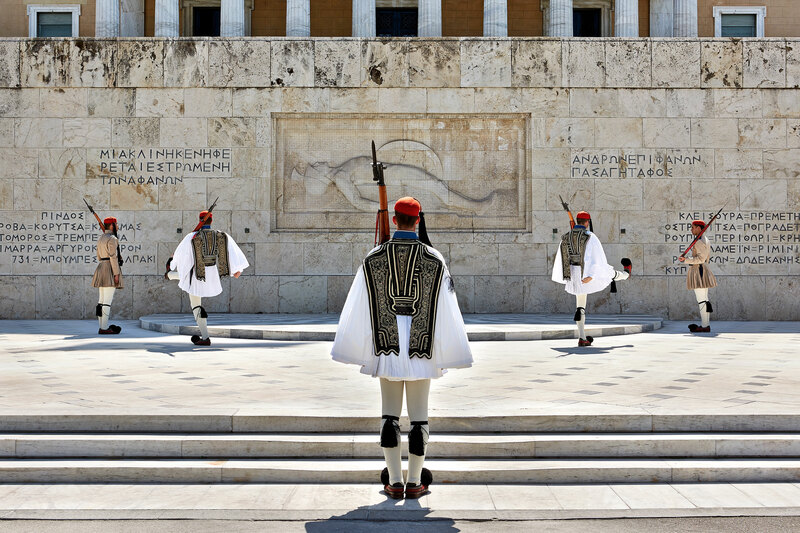 The Presidential Guard, an elite unit of able-bodied young men who guard the Monument of the Unknown Soldier in front of the Hellenic Parliament, was first constituted in 1868 and is still considered a symbol of bravery. The Evzones, also known as Tsoliades, are required to stand guard mute and expressionless for 60 minutes at a time, and are harshly punished if they succumb to the tantalizing efforts of tourists from all over the world to break their concentration. Their duties are mostly ceremonial, but if you think sitting perfectly still for any length of time is an easy feat, then you probably haven’t tried meditating recently! During the famous changing, the guards follow a specific step routine carried out in excruciating slow motion to protect their blood circulation after prolonged immobility, working in pairs to coordinate their movements. Note their intricate uniform, only donned on Sundays and National Holidays (a similar, less formal version is worn the rest of the time), which they are required to pull off in extreme weather conditions, not to mention their height and exceptional physique. The only concession they are allowed is a cape on cold winter days and the occasional dab at their sweaty brows by a sergeant during heatwaves!